S's Frances and Rosarii cutting the cake on their farewell as the last serving mercy nuns to the Oughterard community on Easter Sunday..
Oughterard says farewell to Mercy nuns at the end of 156 years service to education in the community. Rev. Fr. Alan Burke P.P., Canon Moran, Killannin and Rev. Fr. Considine, Rosmuc, (a former teacher of St. Paul’s Secondary School) concelebrated a Mass of Thanksgiving in the Church of The Immaculate Conception on Easter Sunday for the ‘Presence and Activity of the Sisters of Mercy’ in the parish of Oughterard from 1857-2013. Sr Rosarii and Sister Frances are the last of the sisters to leave Oughterard to take up residence in Galway. The Sisters of Mercy are departing the parish after 156 years of service to education at Primary and Secondary school level. The sisters were also engaged in charitable works of mercy within the wider community. Sr. Rosarii was a founding member of Clann Resource Centre. The sisters are leaving behind a totally different Oughterard from the one they encountered on their arrival in 1857 when they met a poor, illiterate population on the brink of starvation, lacking in confidence, a time of evictions and mass emigration when protestant landlords were proselytizing the people in exchange for food and land. Rev. Fr Kavanagh P.P. at the time saw education as a means for his parishioners to rise above poverty and starvation and become self sufficient and he invited the Sisters of Mercy to Oughterard. The sisters brought hope and inspiration at a time of great need. They were a shining light in the community willing to help and assist those in need. 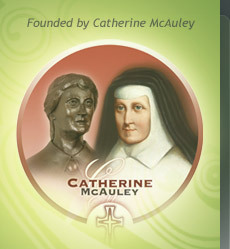 Now they are leaving behind an enterprising, innovative, confident people which in no small way is due to the solid education received by the community from the Sisters of Mercy over the years and especially since the foundation of St. Paul’s Secondary school in 1964 which was led by Sr. Finian. Yes, indeed a “mighty oak” has sprung up from the little acorn of Mercy planted so long ago. Mass was followed by the planting of a cedar commemorative tree in the church grounds. The cedar tree puts down the deepest roots and with stands the harshest conditions in the desert just like the Mercy Sisters endured during trying times in Oughterard over the years. It was through their perseverance and fortitude that they improved the lives of the children under their care. Refreshments were served afterwards in the Community Centre where Miss Maloney presented a cheque from the parish towards the sister’s choice of charity. It is with a heavy heart we bid farewell to Sr. Rosarii and Sr. Frances the last of the sisters to leave us. We wish them happiness and good health in their new home and we thank them and all members of their congregation who served in Oughterard for their commitment and dedication and concern shown to the people through the ages.